There’s a lovely sensation that you can’t help but feel tingle when you hear of a genius bit of casting. And the idea of Samuel L. Jackson going up against The Blob is certainly a cinematic amalgamation that you'll immediately smirk over. Which is why we should all be rejoicing that Goldcrest Films have decided to pair the two together for an upcoming remake of the 1958 sci-fi classic. The Hollywood Reporter have announced that Samuel L Jackson has signed up to play a biochemistry professor in Simon West’s upcoming remake of The Blob. Jackson’s character will be tasked with stopping the rotund beast from devouring everything that it comes across after it starts roaming the earth having emerged from the abyss of our planet. Jackson’s addition will hopefully mean one thing: an endless array of profanity and exacerbated facial expressions as he tries to come to terms with Pac-Man’s evil cousin. Sure, now it might look like an over-filled water balloon on steroids, but back in 1958 it scared the world into such a stupor that the Cold War became a mere inconvenience. This was, in part, thanks to its tantalising log-line of, "Indescribable! Indestructible! Nothing Can Stop It!" 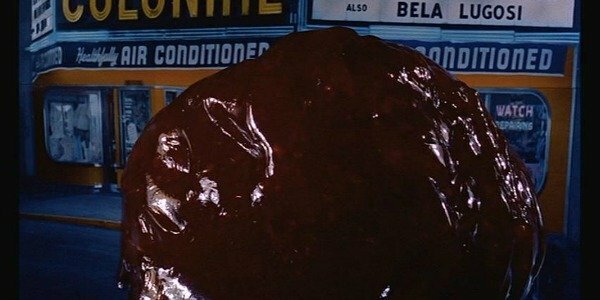 Well, there’s one thing that they didn’t have back in 1958 that could have brought The Blob to a halt. A fully functioning Sam Jackson. I mean, technically they did because he was 10 at the time it was released. But I don’t think he would have been able to fire off rounds of ammo like below back then. Filming on The Blob will start in the fall, and Samuel L. Jackson is just the first of a raft of casting decisions that are due to be announced over the coming weeks. Jack Harris, who produced the 1958 original, is back to produce, while he’ll be assisted in this role by Richard Saperstein, Brian Witten, Judith Parkers Harris, and Taewon Chung. Simon West’s track-record as a director, which has seen him oversee the likes of Con Air, The General’s Daughter, Lara Croft: Tomb Raider, The Mechanic, and The Expendables 2, proves that there is potential for The Blob to be a frivolous, fun adventure. With Jackson now on-board it’s at least going to be watchable, but the next round of casting choices will give us a clearer indication of the type of movie it will be. However: it's so far, so good.